Life is changing in ways I don’t want it to and I don’t know what to do about it. I don’t know that there is anything I can even really do about it. Some days I just sit here, frozen, not wanting to move. Other days I find myself angry, yelling at no one but God or the Universe for no reason. Then there are days I find myself so sad, the tears come unending with the slightest provocation – a beautiful memory or a painful memory. This is the journey I am on with my beautiful son. Yesterday, Brendan Bjorn had his appointment to be molded for his custom wheelchair seat system. It will be another few months before it is finally ready and he will again have the freedom of mobility. But…and this is a monumental qualification to that freedom…it was advised that, due to his various pressure sore areas on his left bottom area and the resulting permanently very vulnerable skin, he now sit in his wheelchair no longer than 2 hours at a time before needing to be taken out and layed down. 2 hours. Just 2 hours. Hearing that didn’t really sink in until late last night and now this morning it has left me feeling lost. What could we as a family do in 2 hours? The closest town is 20 minutes away. There’s 40 minutes just in driving there and back. Will we ever be able to go to a film together again? If so, there will be no going for a bite to eat before or after. What of trips to the beach or a museum or anywhere else he would enjoy? And if one of the pressure areas re-opens, as one is now, that is him bedridden again and us housebound again…still. Earlier this week I tried to be proactive, positive, and rang around to various nursing agencies to enquire about paying privately (not that I could afford it, but just checking) for in-home nursing so Declan and I could have some respite time. What I discovered was that most of them do not provide nurses – only HCAs, which will not be suitable for Brendan Bjorn’s complex medical needs. Others don’t provide private nursing – only via the HSE contracts…and if you follow my blog, you now know about the asinine Loco Parentis policy the HSE is trying to implement. It is not yet an official policy. You will not find it anywhere in writing. Not yet. They are working on the report and it is due out in a few months time, or so I am told. One of the nursing agencies I rang here in County Wexford told me that they have not yet been told to follow this still unofficial policy of Loco Parentis, and that the families of disabled children they currently serve are not required to remain in the home during nursing respite. In other words, it is the Disability Services sector in County Wexford (and I would guess the other counties who are applying Loco Parentis) who have basically elected to do so voluntarily before it is even an official policy. I ask, why? I want some semblance of a normal life back. Some long nearly forgotten piece of who I am to be able to return, be reborn, and be free to thrive again. Instead, upon hearing this 2 hour timeframe yesterday, it felt like another part of me died. I feel like my dreams for my little family – especially for Declan – are being torn from us. Yes, I have so much to be thankful for, I know…I truly, truly know that. And yes, in some ways I feel guilty for complaining about this latest fate when I know some people in the world have it far worse. I am sorry for not being positive in this way, for thinking only of myself, of my sons, and of our challenges. Yet, this is what I am thinking about this morning. Our lives. My life. I just wish I could magically heal Brendan Bjorn’s skin so that when his chair is ready, we would have all the freedom in the world. But I can’t. And so, freedom has slipped through our hands. Wanting what I don’t want. This blog is about the journey of having a child with a life-limiting condition. One of the most pronounced lessons I’ve learned is that it is filled with stark emotional contradictions. I hope in this piece I can try to capture and express those feelings which are, quite frankly, tearing at me as I type this out. Sometimes I want what I don’t want. Yesterday, on my way driving up to Dublin from County Wexford to pick up Brendan Bjorn at LauraLynn, I decided to stop at Avoca and treat myself to breakfast out. I wanted their delicious blueberry and macadamia nut pancakes with the warm maple syrup. I wanted to be relaxed, happy, and enjoying the last moments of being alone before another long stretch (it’ll be about 3 months) of being housebound again. It turns out I didn’t want it. Or, I did, but not the way it was. I sat alone in a room full of families and friends all chatting away with each other at their tables, enjoying their breakfast. It turns out that is what I wanted for myself, too. I couldn’t finish eating fast enough. A couple of days ago I spent a few hours in Wexford town to explore the shops and try to find a few bits I wanted for Declan’s confirmation the following day. I wanted to be surrounded by people also out enjoying the shops just like I would be. I wanted to feel what I used to feel when I was free to go wander wherever I chose to go back in the days I could actually do so. After a few hours all I wanted to do was go home. I didn’t even want to sit in a cafe for lunch. I just wanted to go home and be alone. I think the isolation over the last couple of years is making it harder for me to even be sociable when I get the chance. This morning, I wanted to sit down and work on the book I’ve been writing. I wanted total silence. I didn’t want to hear the PS4 excitement coming from Declan’s room. I didn’t want to hear the TV and Brendan’s feeding pump noise over the video monitor that is always with me. I just wanted peace and quiet so I could get lost in my own thoughts. It turns out I didn’t want it. I felt terrible guilt in even thinking I wanted such peace and quiet because I know that, like many parents in my shoes who have gone before me on this journey, someday I will be the one on my knees begging to hear that feeding pump beeping just as I sit down; I have been that woman who thought I’d never be a mother after having lost so many pregnancies. And I thought, how dare I want anything but to be surrounded by my two beautiful sons. I’m sorry for even wanting such peace and quiet. At least the pancakes were good. Changes – wanted and not. One thing about life is that change is unavoidable. Some changes we desperately want don’t seem to happen, or they don’t happen fast enough. Other changes happen and we don’t want them to. We aren’t ready. We wonder how we will cope. More than one such change happened yesterday. A tissue viability nurse came to review Brendan Bjorn’s pressure sore area yesterday. In addition to the 3 sore areas at the IT point on his left side (see this blog for details), in recent months his skin is also beginning to break down on his scrotum. No one knows why. I’ve tried to think of every possible reason – from his nappy rubbing the area to possible chemical changes in his urine or stools due to puberty to pubic hair causing irritation. Yes, this is a conversation of a personal nature, but I share it because this IS indeed part of our journey. This is indeed an unwelcome change we now have to try and resolve. One change will be no more baby wipes. After 15 years of using them with no issues at all, I am to try using cotton wool and sterile water only for every nappy change. Frankly, my first thought was the increased work with that change. I’m still thinking about it, to be honest. Will I do it? Yes, of course. But when carers such as me are already exhausted physically and mentally, adding to the workload is a daunting proposition. And so I sit here this morning contemplating change. There are other changes to make, too. No more disposable incontinence pads underneath his bottom. Cotton only. That means 2 to 3 times as much laundry. Sorry to disappoint anyone by saying this, but yes, more work added was my first thought. And yet another change will be trying an external catheter system (also known as sheath or condom catheter) to catch his urine into a bag rather than it ever touching what is clearly becoming his increasingly sensitive skin. It will go on like a condom, have tubing going from the tip which leads to a collection bag. While the nurse was explaining it to me, my mind raced with thoughts. Out of my mouth came, “Oh God, another tube line to deal with.” Sometimes my filter doesn’t work as it should. Based on her reply to me, it apparently made me sound like I didn’t want what is best for my son, but of course I do and of course I will try it and of course…I’m just tired is all. Next week Brendan Bjorn will be transported via ambulance to the seating clinic so he can be moulded for a new wheelchair seat. Don’t get too excited reading that; it will still be late July before it is completed and we are free to get out of the house. Half of Declan’s summer holidays will be over by then. It will be more than half of 2019 that we will have been confined to the house by then. The 5th of April is emblazoned in my mind. I will always associate this date with Brendan Bjorn and epilepsy. It was on this day in 2008 when he had his very first seizure. Two years later, April 5th, 2010, he again had a seizure that required paramedics and being lighted by ambulance to the hospital. 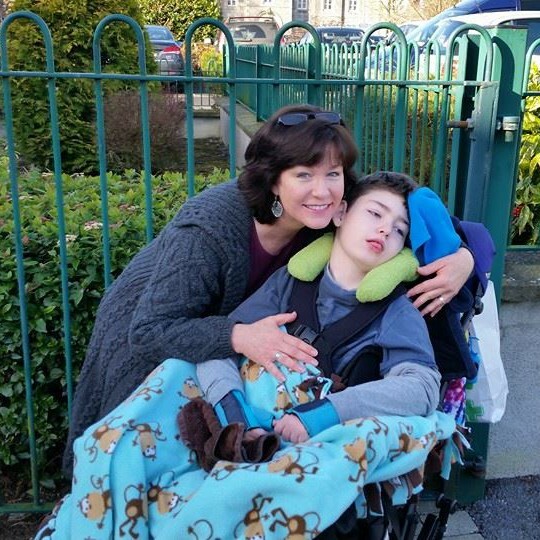 Another two years on, April 5th 2012, found Brendan Bjorn at the hospital to be disconnected from a 48 hour ambulatory EEG when it was discovered his brain was in constant ESES waking and sleeping. I really don’t like the 5th of April since then. I hold my breath until the day passes. I wrote about that first seizure in a blog last year as it marked 10 years to the day since his epilepsy began. He was 3 1/2 years old. I was heavily pregnant with Declan. Brendan Bjorn has changed so much over these last 11 years as his epilepsy has grown worse each year. More seizures meant more medication. More medication meant more side effects. More side effects meant less abilities. Less abilities meant less freedom, less options, less chances to interact with his world. Two years later to the day, April 5th 2010, it was the second time I had to call for emergency services. I heard noises coming from his room and found him at 5am in bed turning blue during a tonic clonic seizure – the date coincidence later dawning on me. He was suctioned, rushed out of the house, as a 23 month old Declan and I followed behind in the ambulance. He had to be bagged in route. Brendan remained unconscious for 6 hours. Another day, another 5th of April, I’ll never forget. His seizures continued to increase. Then, on April 5th 2012, upon getting unhooked from a 48 hour ambulatory EEG, it was discovered his brain was in near constant ESES, sometimes called status for short. I’ll never forget the EEG tech telling me to wait in the room as she looked at the monitor. She told me she had to get the neurologist. That was not typical, so I knew it wasn’t good. A number of minutes later, a clearly anxious neurologist came in asking to immediately admit Brendan inpatient. As Declan was on the other side of the city and I had to collect him from school, I couldn’t do it that day, but agreed the following day to bring him in. The days that followed were an attempt to break the status Brendan’s brain was in. They hooked him up to a video EEG monitor and tried a large dose of diazepam. It didn’t work. The percentage rate of time in status only slightly decreased. The months that followed were attempts at numerous medication changes to try and break the status. None of them worked. Yet another 5th of April I’ll never forget. So, 11 years on from that first unforgettable 5th of April, I will hope today will be unremarkable, and maybe even forgettable, in the best possible ways.